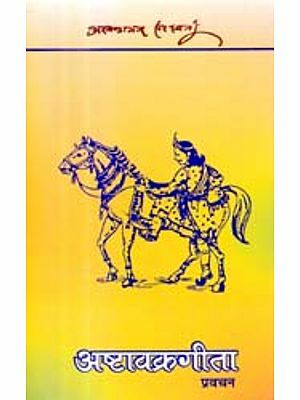 The Astavakra Samhita, or Astavakra Gita as it is sometimes called, is a short treatise on Advaita Vedanta, ascribed to a great sage, Astavakra. 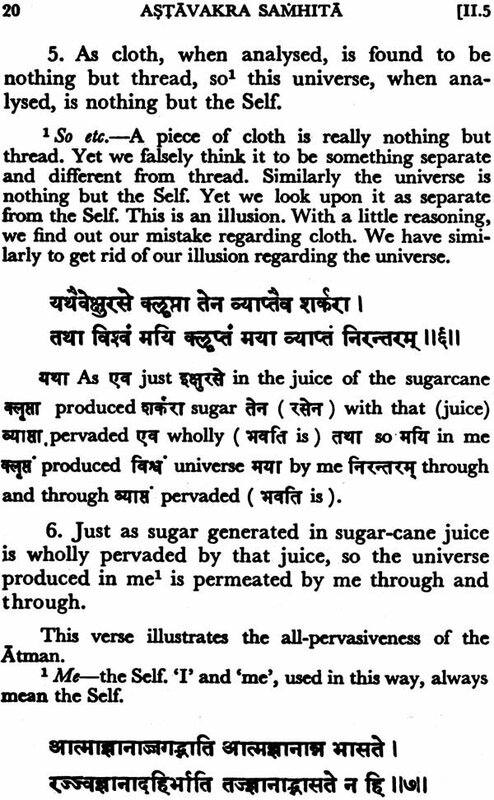 Written in Sanskrit, it consists of a dialogue between Astavakra and his disciple Janaka. Who these two were, however, is not known. Kahor took this as grave insult and cursed his son, saying that he would be born with eight parts of his body deformed. Accordingly, in due course, the child was born with a twisted form and was named Astavakra, which means 'eight-curved'. Kahor went one day to the court of Janaka to beg money from the King. The King had at that time at his court a great scholar called Vandin, who was the son of King Varuna. 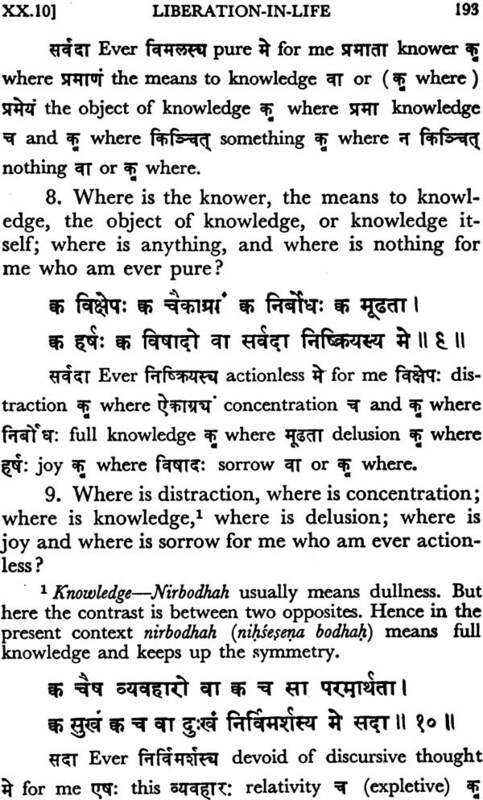 Vandin was profoundly versed in the Vedas, and Kahor was called upon to debate with him. Kahor was defeated and as a result he was sent into the depths of the sea, there to be engaged as a priest taking part in a sacrifice performed by Varuna. Time passed, and when Astavakra was a lad of twelve he heard of the sad plight of his father. Accompanied by his maternal uncle, Svetaketu, Astavakra went to the court of King Janaka. Being a mere boy, he was not at first allowed entrance into the court, but when he gave proof of his extraordinary knowledge of the Sastras, he was cordially welcomed. At once he sought out his father's opponent, Vandin, and entered into a debate with him. A most remarkable controversy ensued, and the boy of twelve defeated the foremost scholar of the court of Janaka. He then rescued his father from the grip of Varuna. Kahor was very pleased at his son's achievement and wished to withdraw the curse he had put upon him before his birth. He therefore told Astavakra to go and bathe in the river Samanga. Astavakra did so, and lo, he came out of the water with all his limbs made straight. But his name continued the same for ever. Coming to modern times, it is interesting to find that this ancient classic, the Astavakra Samhita, played a rather important part in the early life of Swami Vivekananda. When he first made the acquaintance of Sri Ramakrishna he was in intimate touch with the Brahmo Samaj and was under the influence of its ideas and teachings. 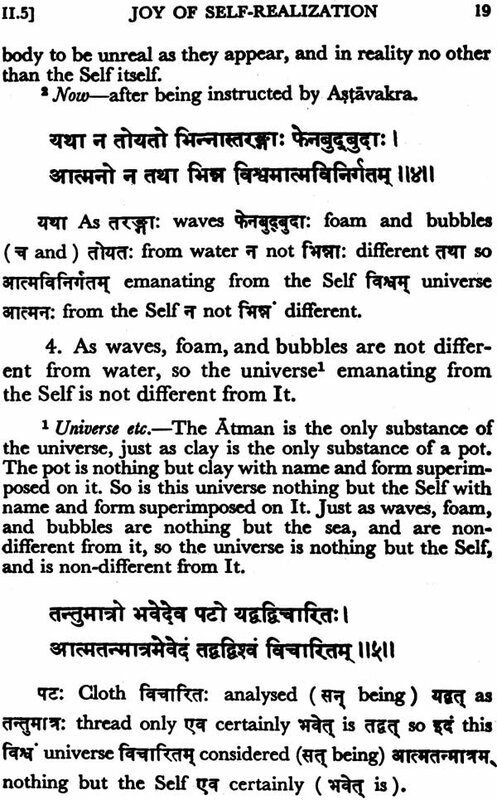 At that time he would not believe in Advaita. But at their very first meeting Sri Ramakrishna had seen into his inmost being and had found that the Swami was pre-eminently monistic in temperament, and in this he was unique among his disciples. But at that time the Swami was quite unconscious of this and so, naturally, he resisted any monistic teaching from his Master. But Sri Ramakrishna found a way to overcome this difficulty. He had in his room a copy of the Astavakra Samhita, and very often he would ask the Swami to read it out to him. After reading a verse or two the Swami would refuse to proceed further. But the Master would induce him to read on by saying that he was not insisting on his accepting this teaching, but only asking him to read it out to him. In this way this book came to have a great influence on his life. He laid great emphasis on Advaita and often declared that it would become the future religion of mankind. 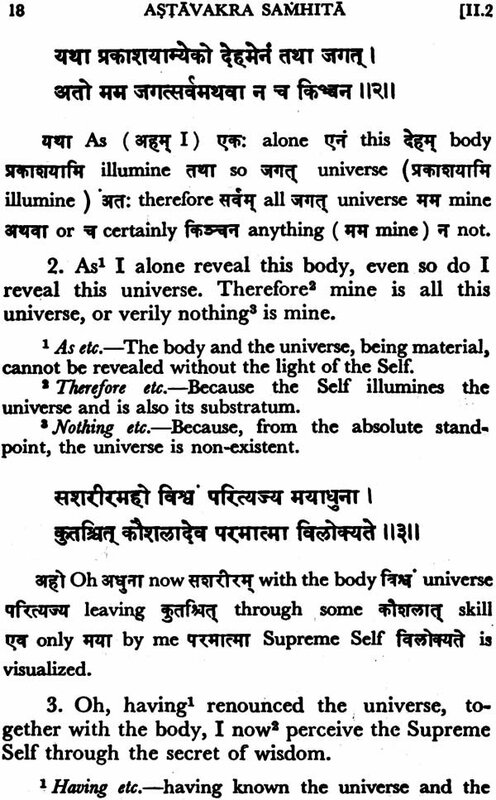 This translation of the Astavakra Samhita, was first published in Prabuddha Bharata, month by month from January 1929 to December 1931. It was revised and published in book form in 1940, a second edition appearing in 1953. In the present edition both the English translation and the notes have been thoroughly revised with many additions and alterations. Considerable improvement has thus been effected. The text is more easily comprehensible and the notes bring out more clearly the central teaching of Astavakra. Earlier, this English rendering had appeared in conjunction with the Kanarese script, published in 1932 from the palace of the Maharaja of Mysore. A second edition of this Kanarese version was published in 1936. We shall always feel indebted to Mr. V. Subramanya Iyer, sometime Registrar of the Mysore University, who took a keen interest in this work and wrote an Introduction for the Kanarese version. He also went through the whole work in its earliest phase, making valuable suggestions for its imporvement. Dr. Satkari Mookerjee, M.A., Ph.D., who has kindly written the Introduction to this book, was formerly Asutosh Professor of Sankrit at the University of Calcutta. He is well known in India and abroad for his deep and outstanding scholarship in the different braches of Sanskrit learning, Pali, and Indian philosophy, including Buddhism and Jainism. We offer him our deepest gratitude for the sincere interest he has taken in this publication, going through the whole work very minutely and writing his most learned Introduction.